QJot is a relatively small, completely USB compatible, alternative rich text editor that saves DOC files, inserts images and more. It is basically meant to serve as a good WordPad replacement. It supports Unicode and runs under Windows 2000 and Windows XP. Its native format is RTF, but it can open, edit and save Word and WordPerfect files (though not with all of their features). It can be used with any script that is supported by Windows and for which a font and a keyboard driver are installed. 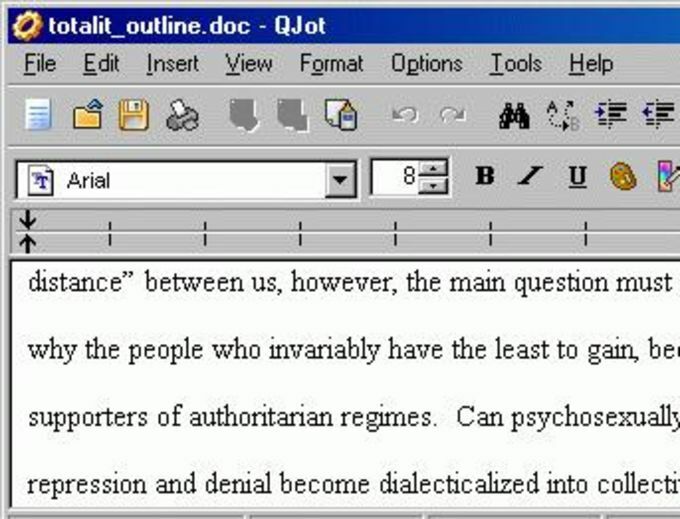 QJot can run from a floppy as well, and also integrates with the dictionary/thesaurus program, WordWeb. See more about WordWeb's use in QJot in QJot's "readme" file. What do you think about QJot? Do you recommend it? Why?